MANILA, Philippines - The Final 5 celebrity performers of “Your Face Sounds Familiar” Season 2 are ready to pull out all the stops for their final transformation and performance as they face off in the show’s Grand Showdown this Saturday and Sunday, Dec 12- 13, 2015 at the Newport Performing Arts Theater, Resorts World Manila. 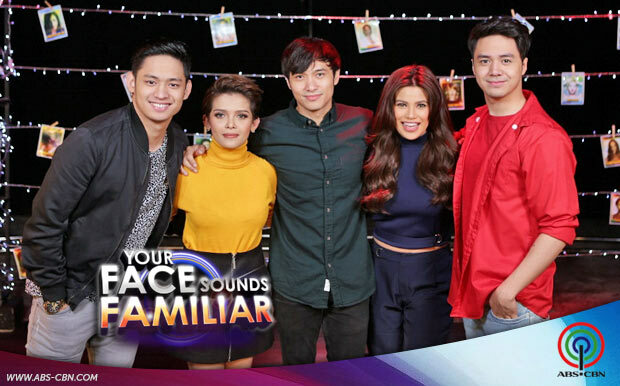 In their quest for the grand title, Denise Laurel, Kean Cipriano, KZ, Michael Pangilinan, and Sam Concepcion will be fighting for text votes from the public. The grand winner will win P2 million, half of which will go to his or her chosen charity. Watch the grand finals showdown tonight and be ready to vote for your favorite celebrity performer. A vote only costs P1 for all networks. To vote, just text YFSFNAME OF PERFORMER and send to 2366 for all networks. The voting will open after all the Final 5 performers have performed. A SIM card can send only one vote per day, so you can vote once on Saturday night and once on Sunday. For the past 13 weeks, the celebrity performers have showcase their versatility in impersonating music icons in different genres and styles.